Thrive is a digital toolkit and learning resource which offers practical steps and suggestions to support inactive people become active and improve their wellbeing. 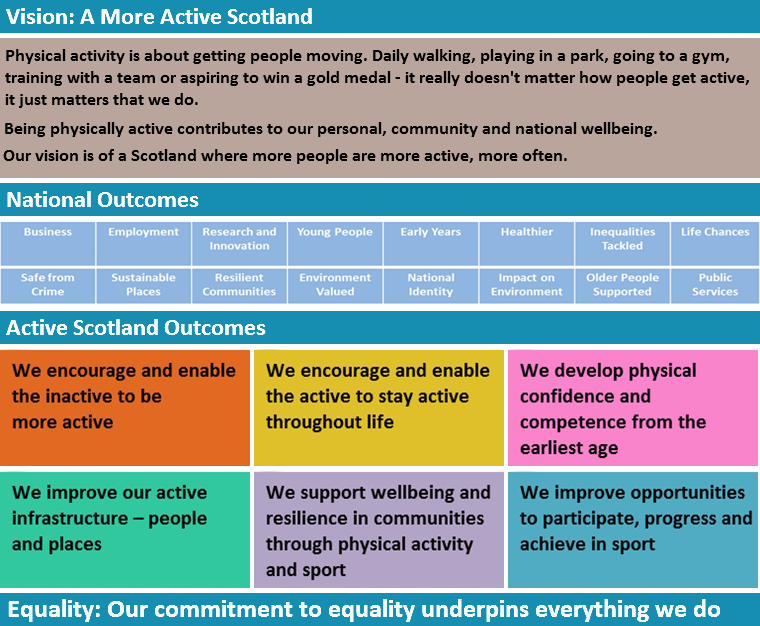 It is supported by a broad range of partners across Scotland and the UK, who have collaborated in its development and who all share a common goal of getting more people active. It is for practitioners who deliver activities (or who are interested in delivering activities) for people to help them become active. It encourages you to learn, change and consider different ways of delivering your activities within communities. We actively encourage you to provide feedback, share your learning and help us develop Thrive further. We know that being active helps people to increase their wellbeing and provides a range of social, physical, emotional and cognitive benefits.Thrive is evidenced based, person-centred, and recognises that becoming active is a journey.It promotes a small step approach which nudges and supports people towards more activity, whatever their starting point. It will support your work towards Active Scotland outcomes. Be better able to support people to become active. Where did Thrive come from? Thrive is based on evidence, learning and insight from the successful Legacy 2014 Physical Activity Fund (the Fund). The Fund aimed to get more people active and learn what works, and doesn’t work, in doing so. This learning features throughout Thrive and includes golden nuggets of insight from our partners. By ‘golden nuggets’ we mean small things which make the biggest difference. Thrive is not a toolkit to plan and fund new projects and activities. We assume you have funding and resources in place to deliver your project and activities. We also assume you have a working knowledge of physical activity and sport policy and practice. Please be aware that the materials on this website are provided as examples only. If you choose to base your own materials on these it is your responsibility to make sure they are fit for your purpose. Thank you for using Thrive. We hope you find it helpful as you engage people and communities to become active, to improve wellbeing and to thrive.